When I first started this blog I said I would review any beverage out there. This Slurpee I got from 7Eleven is the very example of that promised. Drinking a Slurpee and purchasing them are a art. You do the first fill and tap down some on the airy foam, than go for a second pass. You eat with a spoon or a spoon straw to achieve the best mouth feel and taste. If you try to drink just with a straw the concentration of liquid pools in the bottom and may be overwhelming. The Mountain Dew flavor is sweet and airy reminding me of a strong pulp filled orange juice. In fact the secret is that unique green color of Mountain Dew is a orange juice flavor not a lemon or lime as some people might think. 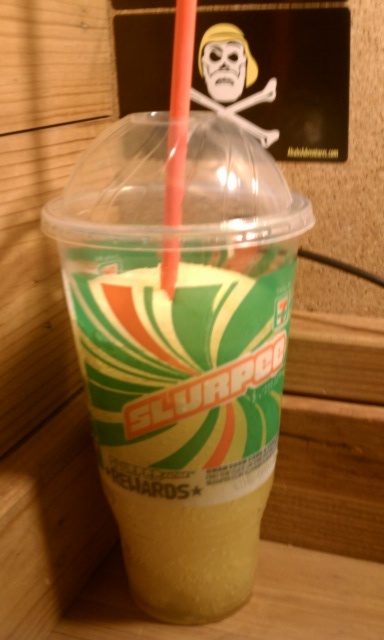 This Slurpee was great today since it was so muggy. The flavor is not exactly like the bottled mountain dew but it close. The flavor is a little stronger or sweeter than regular dew and the carbonation is different because of the process of making the drink. Did I mention Mountain Dew? Question of the Post – How close is you local 7Eleven?